Perfect Fitness Ab Carver Pro for core workout is a more advanced version of Ab roller that allows you to perform workouts more conveniently and efficiently. In this ab carver review, we will explain how the built-in resistance mechanism can increase the effectiveness of your training. Describe the main exercises by which you will be able to achieve a good shape, to train the abdominal muscles, arms and shoulders. We will give an assessment of the most important selection criteria. Finally, tell me where to buy this model. You can easily understand how to use this roller. But perhaps you will be interested in the user manual. We recommend that you read the warnings before using. In addition, it describes the basic principles of operation and use. You can download Perfect Fitness Ab Carver Pro User Manual here. The wheel is wider and has a specific shape. The surface of the tire relief. This allows to increase the stability. In addition, you will be easier to perform turns to the side. So you will be able to do the exercises for the oblique muscles of the abdomen. Inside the roller there is a built-in kinetic engine made of durable carbon steel. It performs the function of additional resistance when rolling out and helps with reverse movement. This allows even the novice user to perform the exercise with a more correct technique and greater amplitude. It also reduces the risk of injury or muscle sprain during sudden movement. Since the training of our brushes are experiencing a heavy load manufacturer has made the shape of the grips more ergonomic. The surface is non-slip and curved. You will not experience discomfort in your wrists. In addition, the handles are removable and you can conveniently store or carry the roller in the bag. Everything you need is included. Additionally, the foam knee pad is provided for more convenient exercise. Beginners will be useful training calendar. It shows the training program for 21 days. 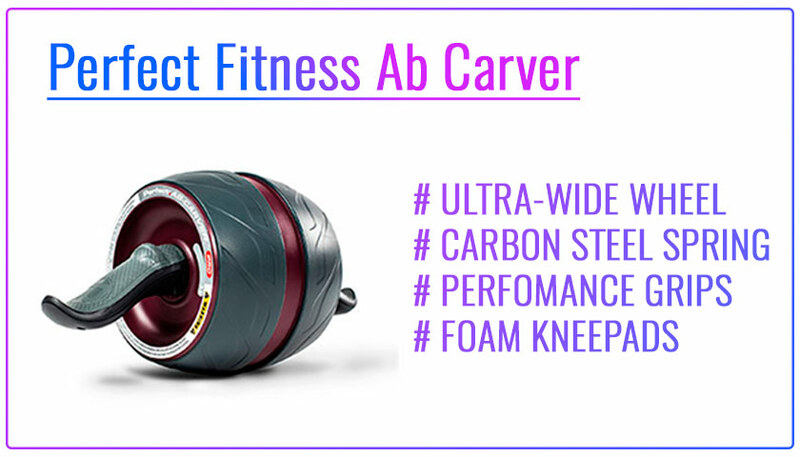 Using Perfect Fitness AB Carver PRO Roller for core workouts is quite simple. On average, up to 40 muscles are involved in training. These are the main muscle groups-the press, arms, shoulders, back, and muscle stabilizers. Besides, it is a good training for the cardio system. Before using it is necessary to perform a warm-up. Curve Straight-this is the main exercise with which you should start using ab roller. The movement range depends on your fitness. Using foam knee pad stand on your knees. Set the roller on the floor and move forward. Pause for a few seconds and roll back to the starting position. If You are not sure that you can do a few reps simplify the exercise. You can reduce the amplitude of the motion. You can also perform exercises at the wall or other obstacles. Rolling out you will rest against an obstacle and it will reduce strain. If this is difficult, try to make the bar and just keep the balance standing on the roller. And also perform similar exercises to develop the muscles of the bark, arms and shoulders. You to do additional exercises If your physical form allows. For a more advanced level, you can do right and left roll outs. Movement with a change of direction will allow to include oblique muscles of the press in active work. This exercise combines endurance training and coordination. You can see more details in the following video. So we can draw a conclusion. This ab carver pro roller will allow you to train more effectively than with other equipment. You can bring yourself into good physical shape, tighten the muscles of the abdomen, arms, shoulders and back. Strong core will be useful for other strength training and for your health. It is also the maximum comfort during training. Thought out all the little things and everything is done perfectly. Finally, we confidently recommend you to pay attention to Perfect Fitness Carver Roller. It’s actually harder than it looks. I long time could not perform 10 repetitions. And only in a month, it began to turn out. Where were you before? I didn’t think to use the wall to simplify the exercise. I have always had a lagging waist in endurance. With AB Wheel, I not only made my abs workout more diverse but also made my lower back muscles more resilient. Now I use a Lifting Belt only when it approaches maximum weight.